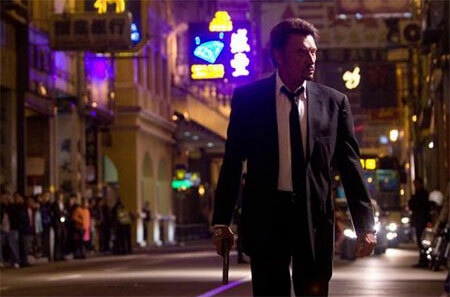 Johnny Hallyday cruises the streets of Macau in Johnnie To's Vengeance. The highly-anticipated Vengeance features familiar Johnnie To themes presented with a fine polish, but neither star Johnny Hallyday nor the script by Wai Ka-Fai make much of an impression. Lower expectations accordingly. Kevin Ma: Johnnie To meets another legendary Johnny in Vengeance, To’s first foray into Western-financed filmmaking. Co-produced by Hong Kong's Media Asia and France's ARP Selection, Vengeance boasts both Johnnie the director and pop star Johnny Hallyday, who took the leading role after original star Alain Delon left the project. For those that don’t know about French pop music, Hallyday is a pop icon in his native land. With a career spanning over four decades, he has been dubbed the “Elvis Presley of France” and still belts out pop songs for bawling fans in France, which makes him as prolific a choice as Delon. Hallyday’s weathered, 64-year old face makes him more than suitable for the role of a former killer out for blood in a strange land. However, Vengeance's problem lies in Wai Ka-Fai’s script, which doesn’t give him nor To much opportunity for a breakthrough. Vengeance seems like a natural conclusion to To's trilogy of films about professional killers, which started with The Mission and Exiled. The film may have a new element in its French star, but it also features familiar themes, situations, and even Hong Kong actors that have been a part of the Milkyway tradition for years. Male camaraderie through food, eccentric and often dark humor, stylized blood sprays, and posing, lots of posing - much of this has been seen before. In fact, if not for the French money involved, Vengeance could easily be a story about a character of any nationality. The simple, linear plot offers plenty of opportunities for To's common themes to surface: French chef Costello (Hallyday) arrives in Macau after a team of mob hitmen (Eddie Cheung, Felix Wong, Ng Ting-Yip) wipes out his daughter Irene (Sylvie Testud), her Chinese husband, and their two sons. However, Irene survives the hit and asks her father to avenge her family. After a short trip wandering around Macau, Costello is quickly able to recruit the help of another hitman trio – comprised of Kwai (Anthony Wong), Chu (Gordon Lam, sporting a Francis Ng haircut), and Fay Lok (Lam Suet) – after stumbling onto a hit for their mobster boss George Fung (Simon Yam). Offered a moderate amount of money and a restaurant in Paris, the three oblige. But there’s a wrinkle: Costello reveals that he has a bullet lodged in his brain from his old hitman days that's causing his memory to slowly and surely fade, and he has to rely on a set of Polaroid pictures to even remember what he’s doing in Macau in the first place. Eventually, the three men go from Costello’s employees to his full-fledged protectors, as they move between Hong Kong and Macau to help their boss find the men who wronged him. Of course, Costello’s memory loss also provides an opportunity for the hitmen to reveal their philosophical side, as they begin to ask questions like whether or not vengeance can still be obtained if one cannot even remember the wrong done to him in the first place. The above would be an enlightening question worth exploring, but Wai Ka-Fai’s script breezes by his existential issues so quickly that the topic barely qualifies as a mention, let alone an exploration. Even with Wai trying to stray slightly from the formula, Vengeance is ultimately a rehash of familiar themes served up in a familiar style. Like Exiled and the first two-thirds of The Mission, the characters of Vengeance are driven by simple motivations, and the role of the script is simply to take these characters from one set piece to another until they reach that inevitable conclusion. However, what Vengeance doesn’t have is the other two films’ dramatic intensity or sense of urgency. At points, the plot simply meanders, searching for its next step. Editor David Richardson gives the film a lethargic, snail-like pace during its dramatic sections, not quite moving the story on its way when it needs to do so. The blame may also fall on To, who had to direct the film in English despite not speaking much of it. The result feels like a Hong Kong film slowed down for Western audiences. For those who want to see what Exiled would be like made in the slow-burn pacing of Election 2, Vengeance is their dream come true. Nevertheless, To remains a master of the gunplay genre, masterfully setting up tense action sequences and executing them with style that simply oozes off the screen. Cinematographer Cheng Siu-Keung makes use of the film's considerably higher-than-usual budget, offering exquisite widescreen compositions and marvelously executed camerawork. When Vengeance is in action mode, it looks and plays like one of the most polished Hong Kong action films of recent years - which is also why the rest of the film is all the more frustrating to sit through. While Hallyday is featured in nearly every single scene, the French Elvis surprisingly doesn’t leave much of an impression. Action-wise, he’s easily overshadowed by his three co-stars (yes, even Lam Suet), and with the memory loss explicitly foreshadowed fairly early in the film, Costello just seems to be bumbling around most of the time, waiting for his hitmen buddies to protect him. Hallyday performs adequately, and may look physically right for the part, but when surrounded by actors like Anthony Wong and Simon Yam doing their thing, not even a star of Hallyday’s caliber can do much to leave an impression on familiar Milkyway audiences. He does, however, deliver one of most unintentionally funny action punch lines of the year - in any language. As per tradition in a To film, the film’s female characters are also overshadowed by the males. Maggie Siu shows up briefly (and obviously dubbed) as a police detective, and Michelle Ye also appears late in the game as Kwai’s lover. Though the latter gives a passable performance and ends up playing a pivotal role in the finale, Vengeance is obviously set in a man’s world, which is nothing new for Milkyway fans.  Kozo's mini-review of Vengeance can be found here.